Home » What are SharePoint Hub Sites? 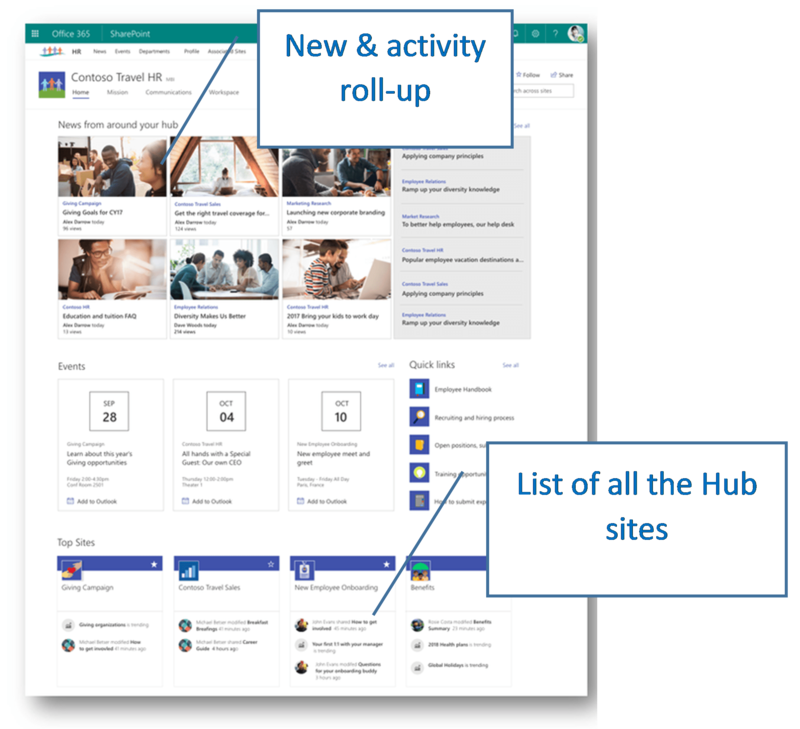 A SharePoint hub site is a newly added intranet building block that brings related sites together to roll up news and activity, simplify search, create cohesion with shared navigation, and for general look and feel. Basically, it connects and organize sites based on organizational attributes such as project, department, division, or region and makes it easier to organize your intranet dynamically. In this blog, we will explore how you can leverage this new feature! The key piece is that you can logically group the different site collections in SharePoint to create one hub without having different types of department/division/region under same site collection. Hub sites bring your organizations team site and communication sites together. Hub sites displays news, events and site activities across all the sites (both team sites and communication sites). Your users will be able to stay up-to-date with the latest news and events within one location. When you search at a hub, you will automatically search from all the related sites. When you search at any sites that are joined, you will have the same search experience as the hub level. Essentially, the search experience will appear for the hub site as well all the team sites and communication sites joined to the hub site. Internally, a search scope is created which allows users to directly search for content within all the joined sites. Hub sites display cross-site navigation, meaning you will see a top navigation bar at the hub site as well as all the joined sites (both team site and communication sites). So, the navigation to any site will be easier. Consistent navigation will be always there in any joined site as well as hub sites. When you join a team site or communication site under a hub site, the site inherits the look and feel, theme, and logo from the hub site level. All of the joined team sites and communication sites will have the same consistent look and feel. Add a site web part to a hub site where you can see activities from the associated sites. Edit the page and then you can see Sites web part in the list as illustrated below. 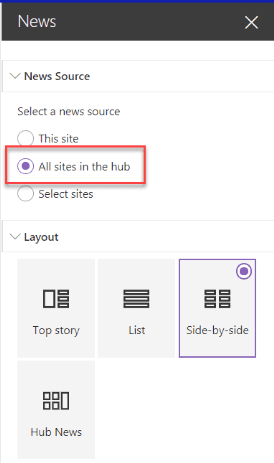 Edit the Site web part and then choose “All sites in the hub” option. Hub sites work only with Modern sites, Modern pages. Sites that are already associated to a hub site cannot be converted to a hub site. You can unjoin a team site or a communication site from a hub site. You can move a team site or communication site to another hub site. One hub site cannot join to another hub site. A team site or communication site cannot be joined to more than one hub site. You can create up to 50 hub sites for an organization, but there is no limit on the number of sites that can be associated with a hub site. Hub sites are not available if you have set up SharePoint Multi-Geo for your organization. When users associate their sites to a hub site, it does not impact the permissions of either the hub site or the associated sites. It is important to make sure all users that have permission to associate sites to the hub have permission to the hub site as well. Hub sites are a great addition to O365! If you want to learn more or have questions, send us an email at info@peters.com or call 630.832.0075 to start the conversation. We are happy to help!